Fault codes can and do vary from manufacturer to manufacturer, even between models from the same manufacturer these codes may well be different. This guide is designed only as a generalized guide and is not intended to replace your owners manual, if you have problems always check the owners manual first, it may well have the information you need and will be specific to your Appliance. We assume no responsibility for any action you may undertake as a result of using this guide. “1E” Water inlet problem >Condition : Not reached to the normal water level in spite of 10 minute water supply Water supply problem. The inlet hose is kinked. The water pressure is to low (10psi) Inlet valve. The inlet water valve filter is clogged. The hall sensor. The impeller of Air guide is bound. Remedy : Check resistance of inlet valve ( 950-1300ohms) Clean valve. Check pressure. Replace the Air braker. “OE” Drain error > Condition: The drain hose kinked or blocked. Wiring connections. The drain outlet of sump is blocked. The drain pump/motor or circuit is troubled. Remove kink. Check wiring. Measure the resistance of drain motor (20-40ohms) Replace the drain motor or repair the circuit. “E1″ Leakage error > Conditon: Excessive RPM of washing motor happened during wash cycle due to water leakage. Possible cause: Water leakage in hose connections,water is leaked by damages. The motor water seal leakage of sump assembly. The height of drain hose connection ( sink drain hose ) is not over 20″. Impeller of the washing pump is worn away. Replace the connections of hose. 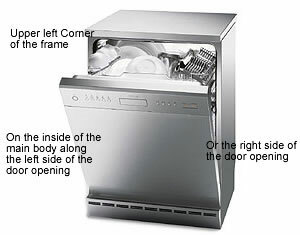 Check the point of damages and repair or replace the related parts. Correct drain connections. Replace the impeller of the washing pump. “FE” Excess Error > Condition : Excessive water is supplied than normal water level (automatically drain pump operated.) Possible cause: The inlet valve is troubled,or the controller. Possible cause: The inlet valve is troubled,or the controller. Replace valve or the controller. “bE” (Thermal error) Condition: the resistance of the thermistor not normally out put. Possible cause the inlet water temperature is very high(over 194Â°F) Wiring connections. Thermistor problem. Check temps to dishwasher 120Â°F needed. Check thermistor 11-14kohms at 77Â°F. Replace the PCB. “LE” ( Motor error ) Condition : The motor is working abnormally. Possible cause : Wiring connections. The impeller of washing pump is locked. The rotor of washing motor is locked. The blade is locked. Correct wiring connections. Replace the cause of resrtiction. Replace the washing motor. Replace the PCB. Sears are a department store not a manufacturer, they contract other manufacturers to build the appliances for them and these are then sold under the Sears/ Kenmore brand. To find who made your appliance, check the first three digits of your model number against the list below and this will give you the manufacturer of your appliance.